World Temperature Data — A Statistical Mess | Climate S.W.A.G. I prefer satellite data to land surface data when discussing global temperatures. Satellite data has calibration issues but it successfully avoids so many of the surface issues. Climate scientists using surface data must accurately adjust data to overcome site location deficiencies, poor and incomplete data and a changing environment. Unfortunately satellite data has only been around since 1979, making it a ridiculously small data set. The IPCC admits in their 2007 report that the uneven nature of temperature sights are a problem today. I can only imagine how difficult the problem must have been….say 150 years ago. That said, there’s lots of temperature data out there….and when I look at all the different pieces of data, I find it difficult to draw the definitive conclusions so many climate experts draw. When the IPCC says they are 90% certain man has caused most of the warming seen in the last 60 years, as they did in the last Synopses Report in 2007, I wonder what they see that I don’t see. 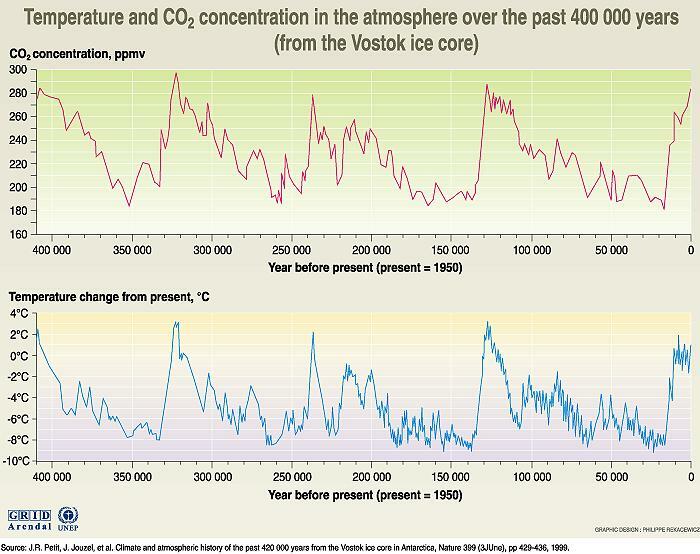 Let’s begin by looking at the Vostok Antarctic Ice Core Data Set. The data ends in 1950 and begins 400,000 years earlier. This chart shows both temperature and carbon dioxide. Sometimes carbon dioxide and temperature go in the same direction, sometimes not. Al Gore used only ice core data as his proof (in his documentary film An Inconvenient Truth) that global warming is the serious problem that he says that is. I find that more than a bit ironic, because ice cores really don’t support his position well. I am particularly fond of the data from about 130,000 years ago. In one 10,000 year period shortly after the peak temperature dropped 6 degrees C while carbon dioxide managed to stay relatively steady at about 270 ppm. Steady carbon dioxide, falling temperatures…and it went on for 10,000 years. I’m also a fan of 345,000 years ago when carbon dioxide increased 15% in 10,000 years and temperature actually went down. I suspect volcanic activity, but then that’s for another post. Let’s move from Antarctica to Greenland and shorten the time span to 4,000 years. Check out the temperature scale in the previous two charts . The Mann graph has almost no temperature change for the first 900 years of the chart, the Greenland core shows a change of about 3 degrees C in the same period. Clearly the Greenland Ice Core disagrees with the Mann Hockey Stick Graph. I’d be the first to admit that both Antarctica and Greenland are poor proxies for the world as they represent individual very cold locations…and the weather in Greenland will not accurately predict climate anywhere else in the world. The data supports the argument that temperature is difficult to accurately measure….and it casts doubt on the validity of the Mann study. Now well finish up with my two favorite very recent charts, the East Anglia University chart beginning in 1850 and a satellite data chart beginning in 1979 provided by the University of Alabama at Hunstville. Look at all that variation in temperature. Wow. And carbon dioxide has been steadily rising. When I look at all this data I wonder how anyone can make statements about global climate and carbon dioxide that are presumed to be uncontrovertible which appears to have become the new buzz word in the climate science game. This entry was posted in Climate Change, Science, Uncategorized and tagged Antarctic Ice Cores, carbon dioxide, Greenland Ice Cores, Mann, UAH. Bookmark the permalink. Why are Skeptics Ridiculed by Society?